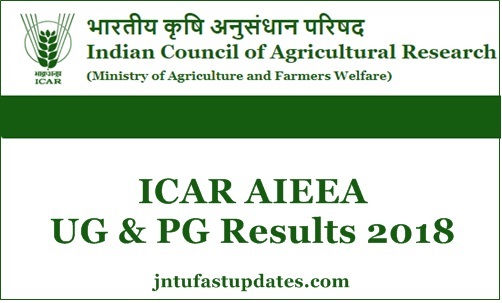 ICAR AIEEA UG & PG Results 2018: Aspirants who want to kick-start their career for higher education has appeared for the test conducted by ICAR for UG Examination on 19th August 2018 and PG Examination on 18th August 2018, aspirants are kept on hold for results for so long and now they can feel relaxed as the results are declared today in the official website. Aspirants took the examination for two and half hour and the result for examination are released now. Around, 50 thousand aspirants have appeared for ICAR Entrance Exam at 56 regional centers at pre-allotted centers. The admissions under 15% All India Quota to the universities across India will be on the basis of selection of ICAR AIEEA Merit List 2018. Candidates who qualify in the exam have to attend Counselling of First Round, Second Round, and Third Round. The Indian Council of Agricultural Research (ICAR) is an autonomous body responsible for coordinating agricultural education and research in India. The ICAR has played a pioneering role in ushering Green Revolution and subsequent developments in agriculture in India through its research and technology development. Before going through the merit list candidates should check the ICAR AICE JRF/SRF Cut Off calculated category wise. Aspirants are waiting for the first Round Counselling so that they can choose the respective colleges and start their career as soon as possible and it is to be started from September 2018. Before checking the results make sure that you have Application ID to check AIEEA PG Result for Degree Programmes in Agriculture and Allied Sciences at Agricultural Universities for 2018-19. The successful candidates will have to register online for counselling procedure. Candidates will be admitted for admission in the sub-subject on the basis of their merit and seat availability. M.B. Chetti, Assistant Director General of the ICAR, has said,the council has initiated steps for ranking State Agricultural Universities (SAU) in the country. Speaking after concluding the two-day review of activities carried out with the ICAR development grant at Kerala Agricultural University on Friday, Dr Chetti said the ranking would be announced soon. Click on the link of AIEEA UG/ PG Results 2018. Download and Take a print out of further reference.